A simple guide for players who want to get started on the right foot in Conan Exiles. 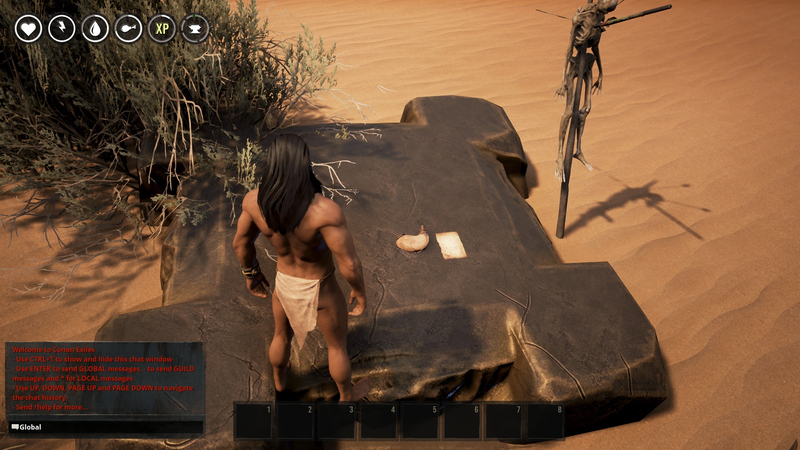 In Conan Exiles, the key to surviving is knowing how to get started. We can guarantee you that this game will not hold your hand and will only provide you with the slightest sense of direction. It encourages you to explore and learn from experience. If you're looking to skip the tedious part where you die over and over again, then there are a few important things you should know before you begin your quest into this treacherous world. 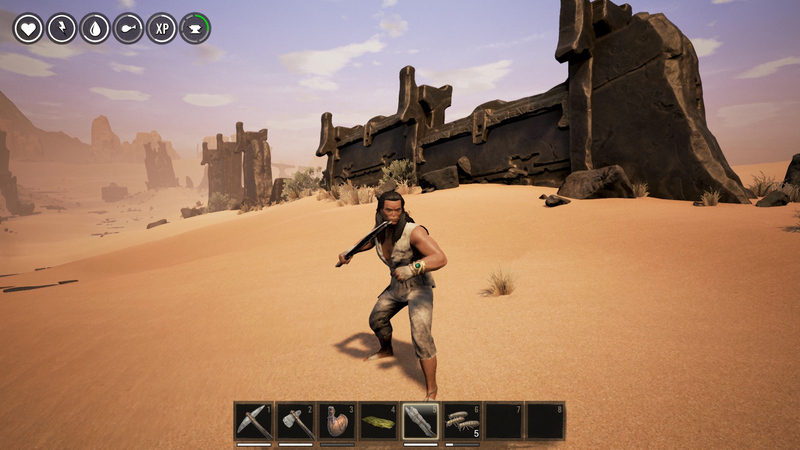 When you spawn into the Conan Exiles world for the first time, you’ll find yourself in the middle of a desert. This is the most important step to getting started so follow these directions carefully or you'll die from thirst. On a rock nearby, you’ll find a canteen and a piece of parchment paper. Pick up both of these things. The canteen will have water in it which will be extremely helpful to you while you’re collecting resources in this desert. Make sure to access your inventory and equip it to one of your quick select slots. In the distance, you’ll hear an animal making noise. Don’t head too far into this direction until you’ve taken the following steps. The next step in getting started in Conan Exiles is to collect as many resources as you possibly can. Throughout the desert, there will be branches, rocks, and bushes. The bushes will give you plant fiber, seeds, and insects. You can eat the insects if you start to get hungry. The plant fiber can be used to make clothes and build your first tools. 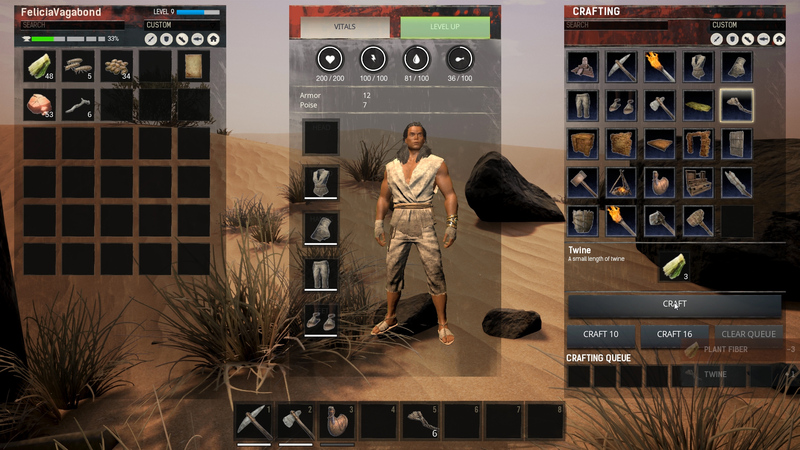 In your inventory, hover over the items under Crafting to see what the crafting requirements for them are. The first things you should build are a pickaxe and some clothes. Where you spend your attribute and knowledge points is extremely important when you're first getting started. At this point, when you level up you should begin placing all your points in strength, vitality, and agility. This will be useful once you reach the next area which will be filled with enemies. While in the desert preparing for the next area, at the very least, get to level 3. This should be easy as long as you keep harvesting resources. The first recipes you should unlock are the Apprentice Stonemason and Experienced Survivalist. These will let you craft the Stone Sword, Fiber Bedroll, and Campfire. These will greatly assist in your survival. 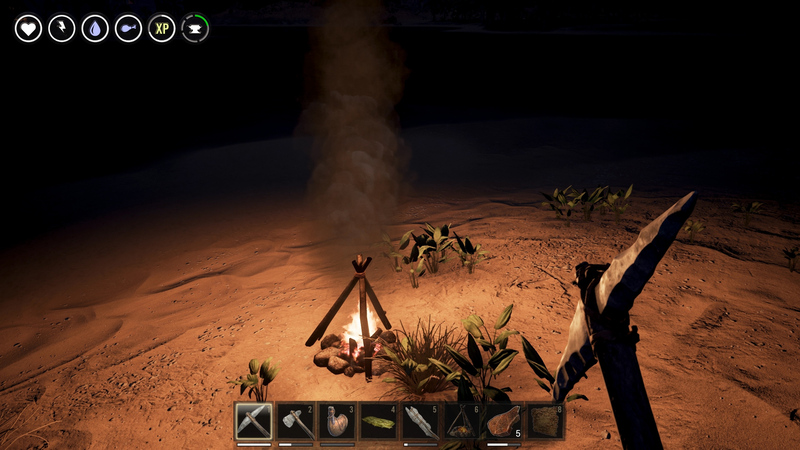 The Fiber Bedroll allows you to create a spawn point (don't use it yet), the Campfire is where you can cook meat, and the Stone Sword is great for fighting enemies. Once you’ve built all of these, you’re ready to head towards the noise in the distance. Once you find the source of the commotion, you'll watch a creature take off into the sky. In the place where it was standing will be a body. Pick up the book that’s beside him. Follow the path of stones that leads into an opening in a canyon in the distance. This will take you to the entrance of the Conan Exiles map. You're officially ready to get started on your Conan Exiles journey! This area is plagued with hostiles such as Imps, groups of Exiles, and crocodiles. If you’ve leveled up your strength, vitality, and agility stats enough, these things shouldn’t be too menacing as long as you aren't picking fights. If you do, be sure to find a safe place to put down your bedroll and set up a campfire. Make sure to collect wood using your hatchet, collect stone using your pickaxe, and kill deer to get meat some meat before nightfall. If this article was useful, check out our other Conan Exiles guides for barbarians that are just getting started that include how to change your religion, and where to find iron. What were your first Conan Exiles experiences like? Let us know in the comments.